SINGAPORE - The committee in charge of conceptualising a memorial to honour Singapore's founders has identified two possible sites for its location - Fort Canning Park and Gardens by the Bay's Bay East Garden. The Founders' Memorial Committee, led by Esplanade chairman Lee Tzu Yang, held a press conference on Monday (March 14) morning to announce its findings after a four-month engagement with the public to seek its views. It recommended building on the area of consensus to develop a memorial that is "values-centred and forward-looking", so as to inspire future generations. The focus of the memorial should also be on the values and ideals contained in the National Pledge, as exemplified by founding Prime Minister Lee Kuan Yew and his team, the committee said. "We have been inspired by the views of the many Singaporeans who participated in discussions through various channels," said Mr Lee. "We can draw from recurring threads from this range of perspectives many ideas for a memorial to inspire current and future generations of Singaporeans." The conditions set for the memorial included being accessible to the public, while it should also incorporate contemplative and civic spaces that facilitate both individual reflection and group programming, as well staying relevant to future generations. It will also need to network and leverage on existing museums and collections, including landmarks, to enrich the learning experience for Singaporeans. Fort Canning Park, which marks the start of the Jubilee Walk, was proposed as it could leverage on its proximity to the National Museum and National Archives of Singapore. The park's setting on a hill, the committee noted, is away from the hustle and bustle of the city and would provide a solemn and contemplative setting. The Bay East Garden, on the other hand, affords a panoramic view of the city skyline and is at an early stage of development, which will allow for more possibilities for the memorial to be integrated with the garden. The Jubilee Walk, which traces national milestones through several key historical sites, can also be extended to include the garden, the committee said. 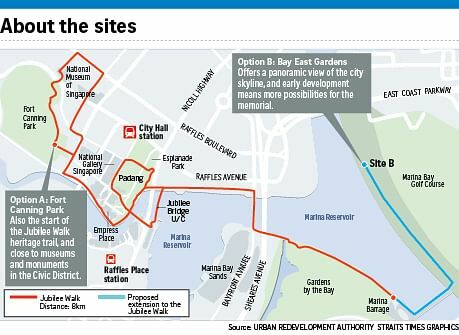 Of the two sites, Mr Lee said the committee was unanimous in its preference for the Bay East Garden site due to a number of reasons. Besides being sited on reclaimed land, which is emblematic of and highlights the possibilities of the nation's future, he added that the site overlooks Singapore's modern skyline where future developments will take place. "It's a site already popular with many Singaporeans, especially during festive occasions as you can catch the fireworks from there," Mr Lee explained. 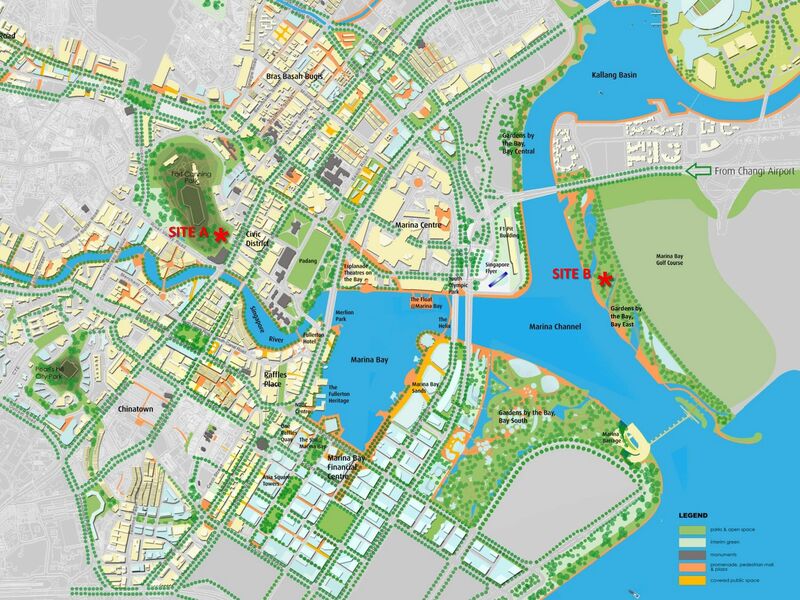 "Practically, it is a less mature site, easier to develop in tandem with the Bay East Garden masterplan. This means it should be easier to integrate, as there's still time to effect development there." It was also cited for having better accessibility and had more potential for programming, although one drawback was it is not located close to the other museums in the Civic District. Mr Lee revealed that the commitee had submitted its report to the Government two weeks ago, and had made its recommendations together with the Urban Redevelopment Authority. The Government could yet decide on a third possible site, he added. Should it take up the committee's recommendation, Mr Lee foresees the memorial being completed in tandem with the larger site development in Bay East Garden. Mr Lee also said the committee studied materials on many memorials overseas. Although they did not visit any, it took some cues from the Franklin Delano Roosevelt Memorial in Washington, which is situated in a sprawling garden. "The difference is that that memorial is to a US President, whereas our Founders' Memorial will memorialise a pantheon of characters rather than a specific individual, and will represent values such as multiculturalism and resilience," he added. Prime Minister Lee Hsien Loong first mooted the idea of a memorial for Singapore's founders in Parliament in April last year, in response to questions by MPs on how best to honour the late founding Prime Minister Lee Kuan Yew. A 15-member committee - supported by the Ministry of Culture, Community and Youth - was subsequently formed in June to examine ideas and conceptualise one. Committee members included former NMP Kui Shiao-Yin, Lianhe Wanbao editor Lee Huay Leng, Ambassador-at-large Gopinath Pillai and former senior minister of state Sidek Saniff. The committee ran a series of eight dialogues from October last year to January this year to gather views from members of the public. Some of the ideas floated included a memorial park at Fort Canning Park, which the seniors' wing of the People's Action Party proposed to have artistic sculptures and features such as pools and landscaped gardens where visitors can reflect on Singapore's journey as a nation. The history fraternity had also called for the memorial to not be a standalone structure but be incorporated into historic precincts like the Civic District. More than 80 per cent of Singaporeans surveyed expressed support for a memorial that commemorates the values and ideals on which Singapore is built.